Whether you’re looking for travel trailers, fifth wheels, or motorhomes for sale we have an RV with an outdoor kitchen for you! There are many advantages to having an outdoor kitchen, including spending time with those you love while grilling up your favorite food! Imagine the smell of barbecue, your favorite drink, and a few laughs thrown back and forth on a cool summer evening in August. Check out our many RVs with outdoor kitchens for sale! Even if you’re looking for extra storage space, you’ll want to check out our Cougar Travel Trailer RV, as it has shelves and a mini fridge to store extra food. If you have a large family or you are having a bunch of friends to come and hang out for the day, an outdoor kitchen is the perfect way to store extra food. Another option when considering whether an outdoor kitchen is right for you or not is the convenience of it being right there. When you’re around the fire or hanging out at the picnic table, water bottles stored in the refrigerator outdoors will allow you to grab and go! 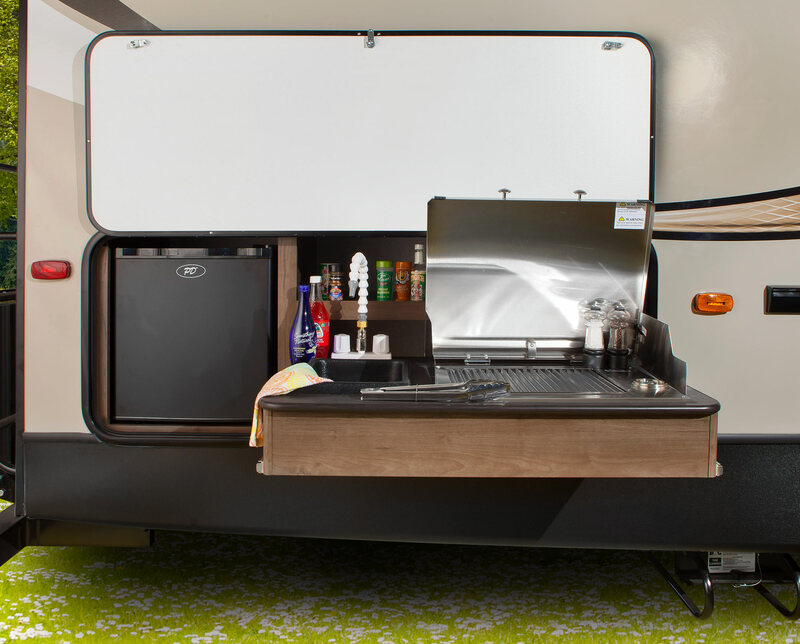 The Keystone RV Hideout travel trailer offers an outdoor kitchen with a stove top, which is perfect for morning brunches! If you’re looking forward to an outdoor meal in the morning, turn on your stove and start whipping up some pancakes! There is also the Keystone RV Cougar Half-Ton Fifth Wheel Series that offers an outdoor kitchen, as well. If you’re looking for a recreational vehicle that provides extra space and an upgrade in luxury, a fifth wheel is perfect for you! 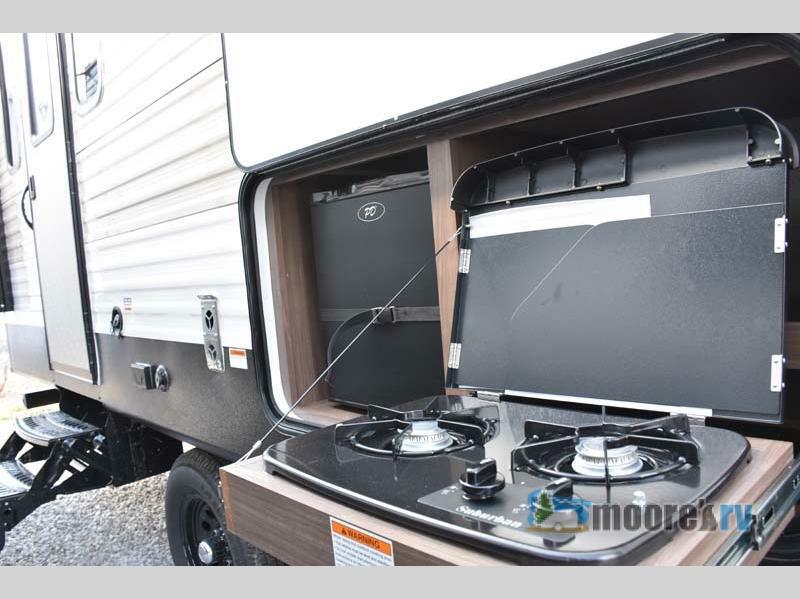 As you can see, we have a variety of great RVs that allow you to enjoy an outdoor kitchen! If you have any questions regarding these recreational vehicles with outdoor kitchens, or want to check them out for yourself, please contact us today! We enjoy one-on-one contact with our customers, and always welcome your inquiries!